12.25x9.25 inches. Eds. Frank Buchstein, Hans Schmidt fing. Andreas Groethuysen. 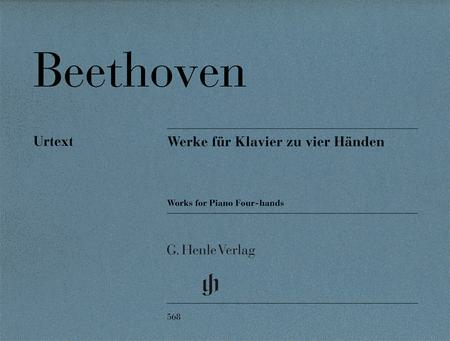 With the exception of the version of the “Grand Fugue” for piano four hands (HN 954), this volume contains all of Beethoven's works for this scoring, to which he only rarely turned. It comprises the Sonata in D major op. 6, the “Three Marches” op. 45, the “Eight Variations on a theme of Count von Waldstein” WoO 67 and the “Six Variations on the Song Ich denke dein” WoO 74 - all of these works are very well-suited to piano teaching. The musical text was revised to follow the recently published Critical Report of the Beethoven Complete Edition, and is now accompanied by new explanatory texts. The piano duo specialist Andreas Groethuysen has also provided fingerings for this work.